This was asked in the 27 chips thread, but I think it's worthy of its own thread. 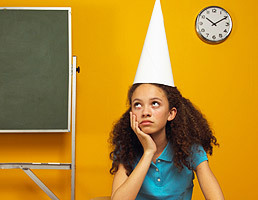 What should be the ratio of the height to the radius of the base of a dunce cap to maximize the ratio of volume to surface area of the dunce cap (thus not including the base of the cone)? As usual, I request anyone who has won a beer to not submit an answer for 24 hours, but they may correct other responses or ask for clarification of my wording. Perhaps I'm misunderstanding the problem, so could you clarify the problem as the logic below suggests an infinitely tall hat. Let's assume the radius of the cone is 1, so the question is what height maximizes V/A. The volume is proportional to h (V = Pi r^2 h/3 = (Pi r^2 / 3) * h = constant*h for a fixed r.
The area is propprtional to l (the length of the slant) = Pi r l = constant*l for a fixed r.
So the ratio of volume to area is the same as h to l (where l = SQRT(h^2+1) ). This means an infinitely tall hat is best. Another way of looking at it is consider a hat of height h then one of height 2h. The volume is twice as much (as all we've done is stretch the cone in one direction). The area is proportional to the distance from the cone's base to the tip. A = cone's tip at height h (x=0, y=h). C = cone's tip at height 2h (x=0, y=2h). AC = new side length of larger cone. Since this forms a triangle AC is less than AB+BC; as l>h this is also less than 2l. So the area of the large cone is less than twice the area of the small cone. So doubling the height doubles the volume but not the area. Thus it increases the ratio of volume to area. So continue doulbing the height (for ever). I think I may have asked the problem badly. Give me a moment. Well, this problem is harder than it seems. I wasn't satisfied with a formula for the lateral surface area of cone so derived it from scratch, which took about two hours. Harder than it seems. That was the hard part. Let's just say that I have an answer and it doesn't involve an infinitely high length. Sorry, Charlie, only good tasting tuna get to be Star-Kist, I'll have to try to find your flaw another time, I have wasted enough time on this for one day. BTW, I think I asked the problem just fine. Don’t give me the beer because I couldn’t remember formula for lateral surface area of a cone so looked it up. Learned it’s like the formula for surface area of a pyramid where the base perimeter is 2rpi. Pretty cool. Where L is the slant length so L = sqrt(r^2 + h^2). Because L is the hypotenuse of the right triangle formed by the height and radius of the cone. Let’s make life easier by setting r to 1. Hmmm. This derivative would seem to go to zero at h being infinite. So I did something wrong too I guess. ...A =....V = ....Hmmm....so I did something wrong too I guess. I agree with the same formula. If you put "Area of Cone" into google you get the formula when clkcing laternal surface and realising that the value is L.
Another way of looking at it is to consider the surface area created by dragging a circle, albeit getting smaller, The average size for the circle will be 1/2, so it's circumference is Pi (2 Pi r where r = 1/2). The distance the circle covers is along the outside edge, i.e. L. So the area is Pi L.
Let's say the lateral distance (from tip to any point on the circumference) of the dunce cap is 1. Then those who argue optimal ratio is found at an infinite height would say that the height should also be 1. How about the other extreme of a radius of 0.99? So a simple ratio of radius to lateral length of 0.5 gets us to a ratio of volume to surface area of 0.1443, much higher than the extremes of a very squat or tall dunce cap. However, maybe you can do better than a ratio of 0.5. To earn the beer, I don't want to see a trial and error answer but a full solution. You didn't ask for the lateral length to base radius ratio; you asked for the height to base radius ratio. Height to Radius ratio 1.732 has Ratio of Volume to Lateral Surface Area of 0.144337567. I have a feeling you either (a) asked the wrong problem, (b) misinterpreted "height," or (c) solved the wrong problem.